Dalziel St. Andrew’s Parish Church » WHITER than SNOW! “Cleanse me with hyssop, and I shall be clean; wash me, and I shall be whiter than snow.” (Psalm 51:7 NIVUK) While on holiday, my wife and I went into a pub-restaurant for a meal. It was one of those establishments where you order your food at the bar. Standing in the queue, my ears were assaulted by the conversation of two middle-aged men. They were working their way through the alphabet of swear words. A, B and C were covered thoroughly, and they obviously got somewhat stuck on F when reading the dictionary as children! 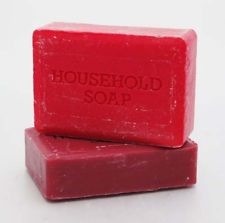 In those moments, I was reminded of the promise my Grannie used to make if ever she heard me utter a single word that was less than savoury: “I’ll wash your mouth out with carbolic!” For the uninitiated, this was the smelliest, harshest and most foul soap known to mankind – not a pleasant thought. Nor was it an idle threat, if you knew my Grannie! Hyssop is the Middle Eastern equivalent of carbolic. An evergreen, bushy plant, it was used to scrub clean sacred places before worship. So, when King David speaks about hyssop in relation to his sin, he is admitting that he needs more than just a quick wash. In fact, he is pleading with the LORD to cleanse him in a way that touches every part of his being – thoughts, words, and actions – leaving him “whiter than snow,” and ready to sing the praises of Almighty God. Now, let me tell you, that’s precisely the kind of wash of which my Grannie would have approved.